I Love You More Than Carrots: Mr. Cooper. I Heart You. In a Major Way. Hubs and I went to see The Hangover this weekend at the constant urging of my brother who, immediately upon seeing it, texted me saying "you have to go see it. it's epic." Let's remember he's 17. And loved the movie "The Anchorman." (The only movie I have ever walked out on). Needless to say, I always take his cinematic suggestions with a grain of salt. However, when I began to see/hear all of the buzz surrounding the movie, I knew I had to go see it. 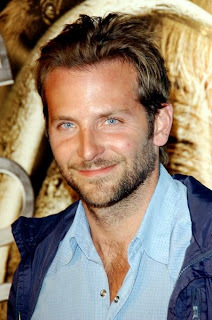 Plus, it boasts Bradley Cooper. And for no other reason than to stare at him for 96 minutes? Sure, I'll go! "Would you please put some pants on? I feel weird asking you twice." "Is this hotel beeper friendly? ...'Cuz I'm not getting a sig on my pager." "Is that a purse?' "No, it's a satchel. Indiana Jones has one!" "I look like a nerdy hillbilly!" And Mr. Cooper? I adore you. I've adored you since first laying eyes on you in 2001 in the movie Wet Hot American Summer. And then there was Wedding Crashers. And Failure to Launch. And Yes Man. And even though you were a total douchebag in He's Just Not That Into You, what with your cheating on your wife and your smoking behind her back and all, your hotness alone could almost have you forgiven. Something about those baby blues... Swoon. If you haven't already seen this movie.. GO! NOW! DO IT! Disclaimer: Bradley Cooper's got nothin' on Hubs and his baby blues.. Double swoon. If Husby wasn't in Vegas this weekend with friends, I totally would have seen it...alas, I'll have to wait until next weekend to laugh out loud and stare at Mr. Cooper. Hi from your newest follower. Super cute blog! I really need to see this movie..it might even be one I can convince the hubs to go see! Omg he is SUCH a babe. I took my parents to see the Hangover on Friday night and the three of us all laughed our asses off. My father has already requested that my first born be named Carlos. Several times. Ha. Oh how I loved The Hangover (and Bradley Cooper)! We saw it last weekend and I haven't laughed so hard since I went to see Forgetting Sarah Marshall. I also hated Anchorman, so I hear you on that. I'm going to have to give Bradley Cooper another chance, because I really wanted to dismiss him forever after his role in He's Not That Into You like you said! I've heard great things about this movie...can't wait to see it! Ahhh I am dying to go see this!! I'm hoping to squeeze it in this weekend!